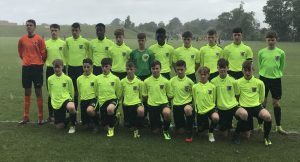 KILDARE finished off their week by beating Athlone 2-1 to clinch seventh place in the Kennedy Cup at University Limerick today. After Wednesday’s soul crushing defeat to Galway in the quarter-finals, Kildare struggled to show anywhere near their best form in Thursday morning’s game against the Limerick Desmond League. Kildare failed to have a single shot on target against a determined side playing in front of their own supporters and two second half goals were enough to give Limerick a 2-0 win. That meant that Kildare faced off against Athlone on Thursday evening in the game to decide 7th/8th place. During the first half, Kildare were much more like their old selves and went in front midway through the half when Callum Bolton’s 25 yard shot found the net via a huge deflection. Kildare doubled their lead shortly after when Dylan Murtagh took advantage of a mistake by the Athlone goalkeeper to score his second goal of the week. It was almost 3-0 shortly before the half time break but Brandon Leonard’s superb header after another pin point free kick from Ben Coen was ruled out for a slight push. Athlone came back into the game after the half time and pulled a goal back from the penalty spot. They had chances to score an equaliser but found Kildare goalkeeper Kajus Asksamites in inspired form and he made a string of brilliant saves to ensure that Kildare finished the week on a high with a 2-1 win. Overall, a seventh place finish is a good result for Kildare and it should ensure that the league will again be among the top eight seeds for next year’s competition. However, there will always the nagging thought in the mind of everybody involved with this year’s squad that this was the one that got away. Kildare were one clearance of a corner away from beating Galway in the quarter-final of the main competition and setting up a very winnable semi-final against Sligo/Leitrim. The players did everything asked of them, and more again, but luck wasn’t on their side in the crucial moment of the week and everybody is left to wonder what might have been if they had been able to hang on to that win.